Maria McKee is one of a kind, but that’s really not giving her enough credit. 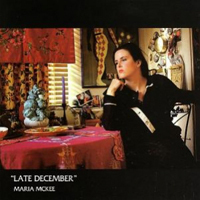 Not only is she an artist like no other, but each of her albums is a Maria McKee album like no other. Her fans have long given up trying to predict where she’s going next; indeed, when the broadly theatrical High Dive came out a few years back, it was hard to believe that this was the same woman who used to front the roots-rock band Lone Justice, touring with U2 and even playing on SNL. Late December is another left-turn in a career that’s been full of them. To say that it’s nothing like her last album is, at this point, stating the obvious; while Peddlin’ Dreams was an intimate, tear-stained set of folk ballads and rootsy rockers, December is grandly theatrical, lush and vibrant and brimming with sounds and ideas. Musically, it falls somewhere between Life is Sweet-an album that stands as a classic for its mix of ragged, art-rock guitars and striking, confessional poetry-and High Dive, an album that didn’t really work because of its annoying, over-the-top, showtunes-inspired songwriting. The hushed tones of Peddlin’ Dreams are almost completely absent. December is indeed a theatrical work, with many of these songs sounding like they could have been inspired by movies or novels; to lift a phrase from Over the Rhine, they’re like films for radio. But they retain their sense of poetry, of intimacy, of melody, and of focus-something that High Dive didn’t quite have-and so it works not only as a soundtrack to some imaginary music, but also as a rock album. And McKee, along with producer Jim Akin, has her imagination turned on high. The whole record feels giddy with ideas and alive with creativity, lunging from style to style like a kid trying to decide on a type of candy. The title track, with its finger-snaps and Motown backing vocals, falls somewhere between gospel and R&B. “Too Many Heroes” is a slick rockabilly number. Some songs simply can’t be classified. what ties them all together is McKee’s clear, strong vocal performance-her best yet-and the fact that, with hooks like these, every song is a sing-along. It’s a thrilling mix. And it’s not just the most creative and surprising album yet released in 2007, but it’s also tremendously fun and wildly entertaining.